What Would Your LinkedIn Profile Sound Like Out Loud? How would your LinkedIn profile sound if someone were to recite it out loud? Is it something that you would feel proud of, or perhaps make you feel a little bit silly? Well that’s exactly what LinkedIn Out Loud have done! 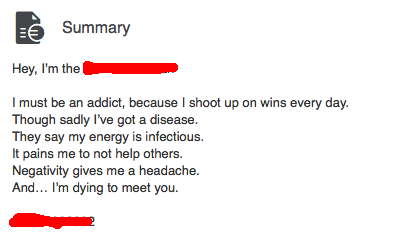 They have created a hilarious video series and Tumblr page using genuine LinkedIn summaries from profiles that they have come across when browsing the network. Careful what you write on your profile, or you may fall target next! They must have been so busy working harder than everyone else to write a decent summary. No I’m not…No I don’t…Nope I haven’t done that either…Oh wait I see they’ve done there. If you’re looking for a tennis playing economics major with a boxset addiction to work night shifts…here’s your man! Oh gosh, maybe they should see a doctor! I’m not sure what kind of job this one’s after! Check out the first video of the series below for some more great quotes.